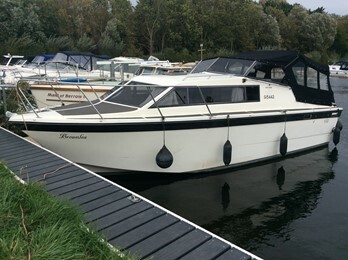 The Duchess 9mtr was developed using the Seamaster 820 mouldings. This semi displacement hull has a tall free board hull offering large internal volume.The forward cabin has panels which can separate this area if necessary. The dinette to port can either be used as a wrap round style seating or railway carraige style seating. There is a bench seat opposite. The galley to port is offset and includes hot water fridge and cooker. The toilet compartment to opposite has a fitted shower unit and tray. The engines fitted were twin Volvo 2002 or 2003 series diesels on conventional shaft drives. The power rating per engine varied between 18hp and 43hp.